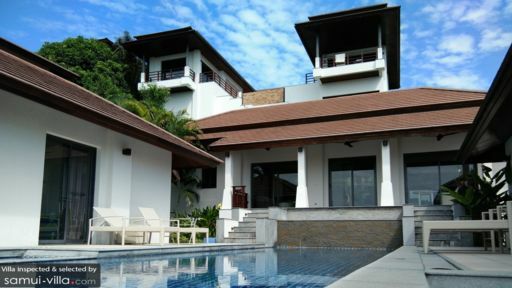 Villa Kalamona is part of the lavish Horizon Estate located near the shores of Choeng Mon beach, Koh Samui. The villa is mere 700-metres away from the beach that offers you splendid scenic views of the ocean and surrounding lush tropical vegetation straight from the villa itself. 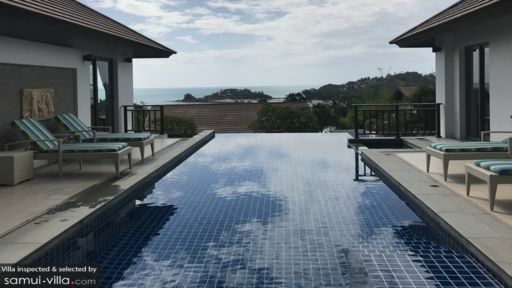 With an infinity swimming pool and bedrooms that feature glass doors overlooking the ocean, you are never too far from Samui’s natural splendour. The three-bedroom villa is ideal for families as it has a spacious garden where the kids can run around freely and modern conveniences to keep everyone comfortable. Three bedrooms with designer interiors are found around the swimming pool, with stunning views of the ocean from two rooms. With classic elegance and Thai influences, the bedrooms pioneer in comfort and unforgettable experiences. Two bedrooms are furnished with king-sized beds and the third bedroom features single beds that can be joined as a king bed upon request. Since you have direct access to the swimming pool, you can enjoy a morning dip without a problem. The bedrooms are air-conditioned to provide you with a soothing ambiance when you wish to retreat to your personal space and block all sounds from outside. You will find additional sitting in each bedroom so you can even do some work or read a book while enjoying the beautiful panorama. Ensuite bathrooms accompany the bedrooms for ease. The highlight of Villa Kalamona has to be its stunning swimming pool that runs the length of the villa with a sprawling view of the stunning blue water of the ocean. You can even enjoy watching the dense, green islands that are near Choeng Mon beach. The pool deck accommodates several pin-striped, tropical-inspired sun chairs where guests can lather on their sunscreen and lounge under the warm tropical sunshine. The villa is found on an incline and is multi-storied for beautiful views. Stone steps from the pool deck lead you to the well-furnished terrace that houses a rattan lounge area with periwinkle blue upholstery and an alfresco dining space for meals against a beautiful backdrop. Inspired by tropical modernity, the interiors at Villa Kalamona ensure you have an airy layout which is pleasant and comfortable. Furnished with a charming blue sofa-set, the living area provides a space where guests can kick back and relax without a care in the world. Towards the front, you have the swimming pool and the back leads you to the villa gardens. The interiors are modern with glass-top coffee tables, floor lamps and decorative flowers. An entertainment console stands against the opposite wall with a flat-screen TV, DVD player and music player. A six-seater dining area is found indoors with nature-green chairs and a glass-top table for intimate meals with friends and family. A spacious and well-designed modern kitchen stands in the corner of the living area complete with its own breakfast bar and high stools. Equipped with useful amenities and appliances to help you with cooking your meals, the kitchen makes it easy for you to enjoy food even in the middle of the night. Villa Kalamona offers first-class amenities and services to guests where the staff is always at hand to help you out. Housekeeping, security and maintenance of the villa are taken care of. Services such as massages or a babysitter for your children, renting a car and hiring a private chef are available upon request as these are charged extra. 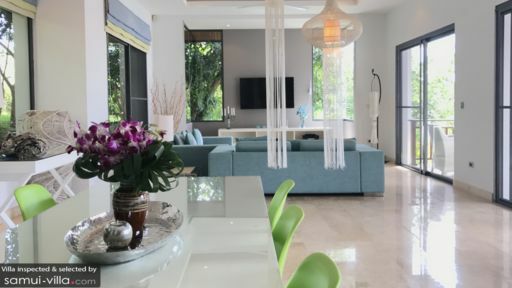 Located only 700-metres away from Choeng Mon beach, guests of Villa Kalamona can enjoy the many sights near the area such as the pristine, white sand shores and the blue water of the ocean. There are beachside restaurants near the villa as well such as Dining on the Rocks. You can make your way to Chaweng Beach, another popular tourist destination. Big Buddha Bophut offers some beautiful and scenic views of the ocean.